You might have seen the news last August that Jill’s, the St. Julien’s restaurant, started offering a vegan buffet for lunch every Friday. I myself missed it but apparently enough people heard the news that the offering is still ongoing five months later. And going strong. Dining there last week, our excellent waiter said the Friday vegan buffet is extremely popular and estimated over 50% of the diners each week are vegans. 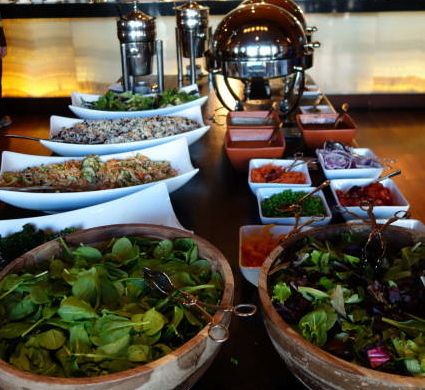 That is entirely understandable, as the buffet offers an incredible variety of food for vegans and greatly adds to the vegan choices available in Boulder. 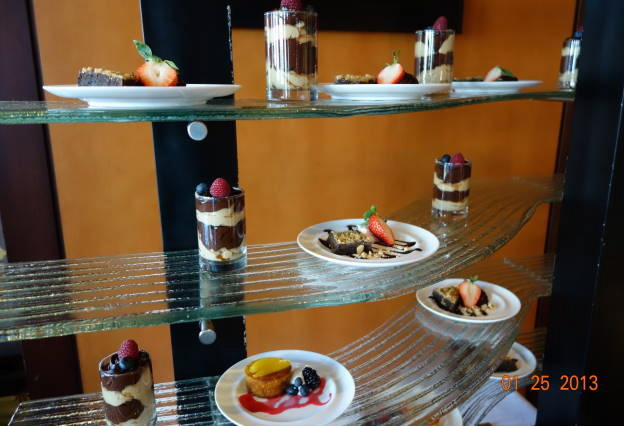 However, my impression while trying the pizza, pasta, soups, salads, and desserts was the buffet offered an amazing variety of delicious food that anyone would do well to try. Even better, it all comes at an extremely reasonable price: $12.95. I had the chance to speak with Philippe Antoine, the curled-mustache, French general manager of Jill’s, while I was visiting. Philippe is an awesome representative of the establishment with his French accent, smooth demeanor, and vast knowledge gleaned from four decades in the restaurant business. When you visit, definitely say hello if you see him. 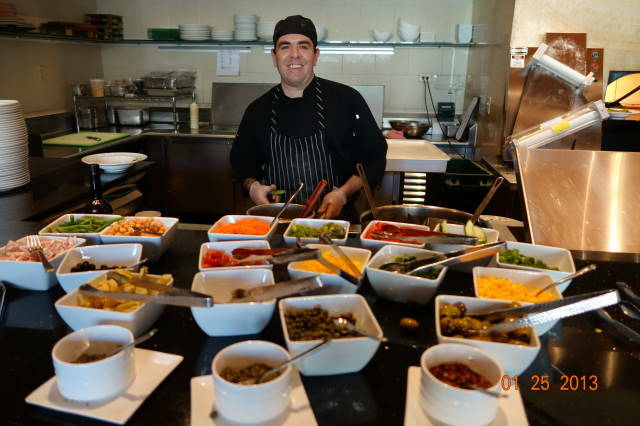 Phillipe explained the buffet was, in part, the idea of one of the owners of the St. Julien who is vegan herself. He also described how vegan food was not really in his culture, growing up in France. As a tour operator, I can attest to that. Asking for a vegetarian meal often means getting the same plate as your friends with no meat and twice the vegetable side dish. Everything was vegan, including the pizza. (The date and caramelized onion pizza was outstanding.) 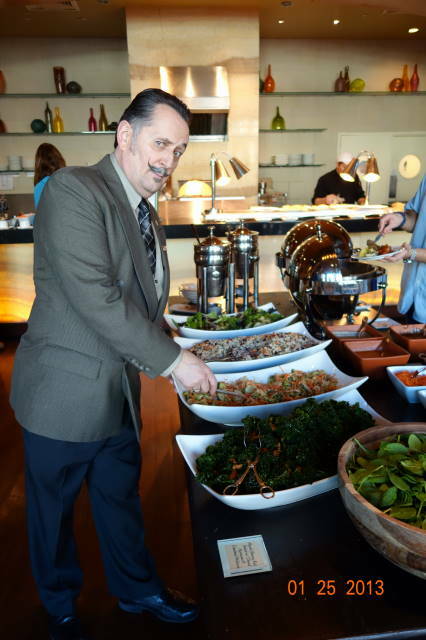 My favorite item of the buffet was the “choose your own pasta” bowl. As someone who tries to get many vegetables in my diet, I am always a little disappointed ordering pasta in restaurants as it is usually heavy on the pasta and light on the vegetables. In this case, I was handed a bowl and told I could select my own ingredients. I chose sauteed spinach (a lot! ), grape tomatoes, black olives, artichoke hearts, basil, and oregano and then paired it with a pesto sauce (choice of three) and rigatoni. Five minutes later, the pasta bowl was ready. The flavor literally (okay, not literally) jumped out of the bowl and the veggies outweighed the pasta. It was, seriously, the best dish of pasta I have had in months and well worth the price of the buffet on its own. I don’t think you can lose on the experience. If you don’t like one item, you have six more from which to choose. The price is right, the service is excellent, and you are eating for a healthy cause: you. Editor’s Note: Allan and his wife Devon were hosted by Jill’s for his visit. Jill’s is a strange place. Such a great location, right? Across from 10 10, next door to The Med…and a stone’s throw from several of Boulder’s best. But it hasn’t caught fire. Too bad, because the hotel itself is pretty awesome. My Jill experiences have been luke warm at best, but this buffet sounds really good and properly executed. For $13, I’m going to give it a shot. Two questions: 1) I assume alcohol is extra, but what about tamer beverages? And 2) is there a soft-serve dispenser? I agree with you. I haven’t spent many hours in Jill’s either and I wonder whether it is a function of we locals not wanting to go to a hotel restaurant, given the sometimes sketchy nature of those establishments. That is one reason I was so pleased to have loved the food when we did go. 1. I am sure alcohol is extra and am guessing other drinks are too. We drank water. 2. You could drive up Walnut and hit one of those new Fro Yo places. Thanks, Allan. I was joking about the soft serve, but I do like Fro Yo! Next Next post: Parkway Cafe: It’s Democratic!